Way up here in the land of tall conifers, dry shade is a common gardening challenge. Indeed, if I had a nickel for every time a client has asked me “What can I grow under my cedars?” you wouldn’t be reading this post because I would be at a hospital somewhere on the Mediterranean coast getting treated for 3rd-degree sunburn and terminal red wine poisoning. The quandary proposed by finding plants that will be happy in the darkness of looming coniferous branches is bad enough, but trying to find plants that will compete with thirsty tree roots beneath a rain-shedding canopy of thick evergreen foliage is another kettle of horticultural fish altogether. Fortunately, there are several species that have adapted themselves to these conditions, so all is not lost. Before we leap into the plant list, there are a few things a gardener can do to alleviate these pre-existing conditions. Most trees can be limbed up a bit or the canopy can be selectively thinned to let in more light. Conifers can handle the careful pruning of smaller branches (less than 2” in width) quite well, but the only thing you should ever do to the branches of our magnificent broadleaf evergreen Madronas is admire them. Never remove more than a fifth of the foliage of any tree during one calendar year, and thinning of branches on large trees is a job best left to an ISA certified arborist. Hundreds of homeowners are injured annually during misguided pruning attempts, and it’s much less expensive to pay an arborist than an emergency room doctor. Not surprisingly, if your soil is dry, one can always provide additional water, but trying to curb your planting enthusiasm until the rainy season will greatly increase your chances of success. Most conifers are quite happy to receive additional summer water, but our fussy madronas again require extra caution. 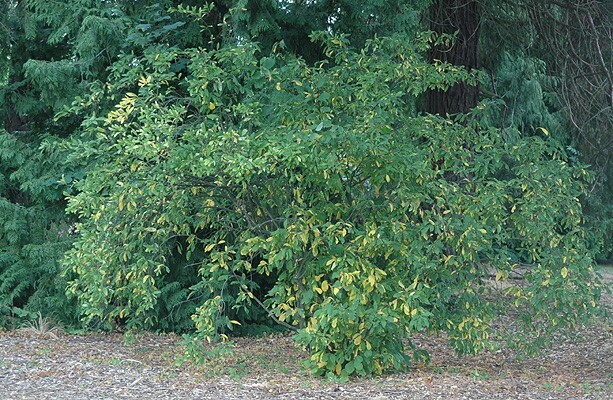 Madronas loathe summer watering, so underplanting a madrona should be done during the fall and winter to take advantage of our seasonal monsoons. Be sure to use smaller plants (4” or one-gallon pots) to minimize root damage. Summer irrigation of new plantings under Madronas should be kept to a bare minimum, using just enough water to keep the plants alive until the rains return in the fall. Stay at least 3 feet away from the trunks of all trees when digging planting holes, and avoid cutting any roots larger than 2 inches in diameter. Better still, it’s far easier to relocate a planting hole than it is to cut roots, and much better for the health of your tree. If possible, phasing in your new plantings over a period of a couple of winters will spread the inevitable root damage over a longer period of time. A light mulch (2” or less) of arborist chips is helpful, but never add “topsoil” or planting mix over the top of tree roots, as even a couple inches of soil can smother roots systems and result in dieback. And now, to the plants! I’ve had success with all of these in the shade of conifers, and they also work well in deciduous woodlands or in the dry rain shadow of north-facing buildings and garden walls. As with any new plantings, they will require summer water for several dry seasons until they have established a root system capable of competing with existing tree roots. Some may even require a little water during our rare spring dry spells, so monitor new installations closely. Providing a little sun by judicious pruning and an occasional summer watering after establishment will greatly tilt the odds in your favor. I suppose in a sense all plants are “groundcovers” because, well, all plants cover the ground, but generally when folks speak of groundcovers we are discussing plants of low stature which spread at varying rates of growth. Since evergreen trees shed cones, leaf scales, spent flowers, berries, old needles, and bark at various times of the year, it’s a good idea to avoid all but the sturdiest evergreen groundcovers in these areas lest they be smothered by mother nature’s self-mulching system. My preference is to use herbaceous plants that can be cut back to their crowns in late winter before the new foliage or flowers emerge. Take care not to damage the crown or any emerging vegetative or floral growth. Choosing plants which seldom need dividing helps minimize tree root disturbance. Water occasionally until plants are established, and then provide minimal supplemental irrigation if plants show signs of drought stress. 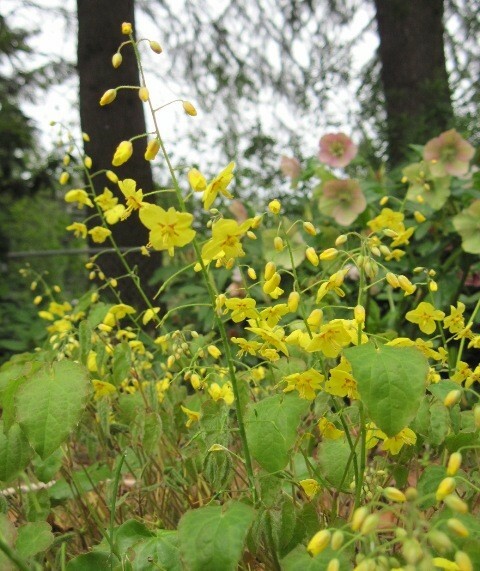 Commonly known as Bishop’s Cap, Fairy Wings, or Barrenwort, the Epimediums were one of the “it plants” of the late 20th and early 21st centuries, and approximately 7 gazillion cultivars are now available. Look for cultivars from species like E. rubra, E. warleyens, E. grandiflorum, and E. perralchicum. 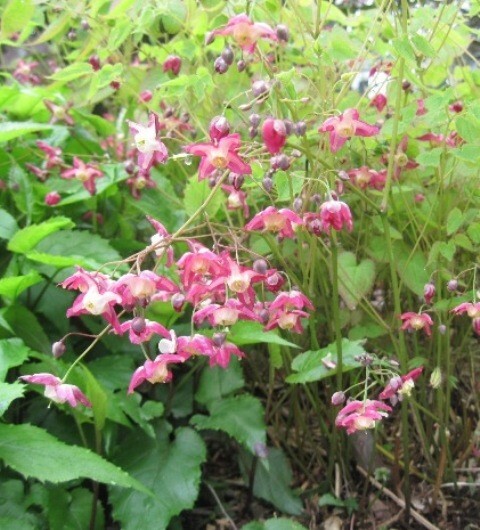 Epimediums grow slowly into tight, weed-smothering clumps, with tiny flowers in early spring followed by tough leathery foliage which flushes in hues of red and pink. Flowering is reduced in deep shade, but they’re still a great foliage plant for difficult situations. Easy care; just cut the whole plant to the ground in late winter, using caution so as not to damage the emerging flower buds. The Hellebore, or “Lenten Rose” is not a rose at all, but rather a low growing perennial with lush, tropical foliage. Also very popular with the hybridizers, and a wide selection of colors and flower types are available, but the common type species is still well worth growing. Large flowers make a nice display when floated in a bowl of water. Prevents weed seedlings with dense growth, and its propensity for producing plentiful offspring results in many of its own seedlings to share with friends. Seedling color is variable, so if you are growing one of the fancy-pants selections, you should ruthlessly weed out the offspring to preserve your original investment. Or you can pot ‘em up and see what Mama Nature’s genetic lotto has brought you. 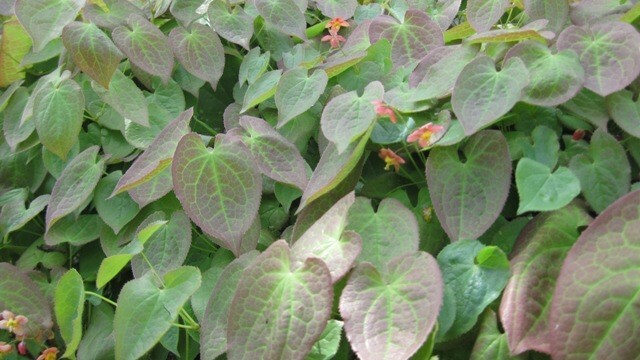 Care is the same as for Epimediums, just cut last year’s foliage and flower stems to the ground in late winter. Occasional aphid outbreaks are easily dispatched with a blast from your garden hose. The true Geraniums offer many options for dry shade. Some of my favorites include G. macrorhizzum and G. x cantabrigiensis. Look for cultivars like G. macrorhiizzum ‘Bevan’ or ‘Ingerverssen’, or G. x cantabrigiensis ‘Biokova’ or ‘Karmina’. 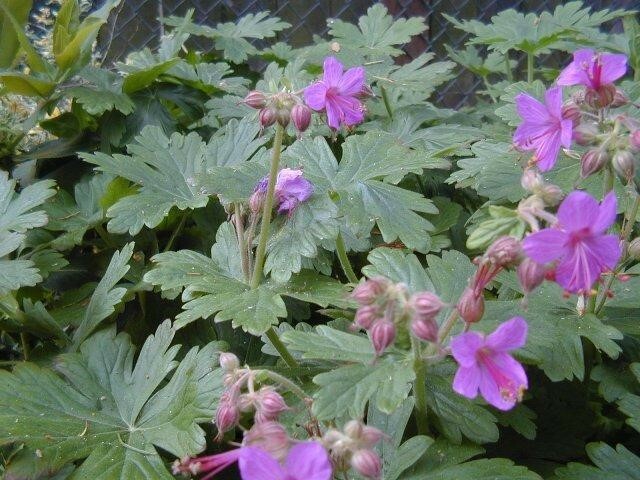 Many other Geranium species also work well in shady spots, dependent on the difficulty of your existing conditions. 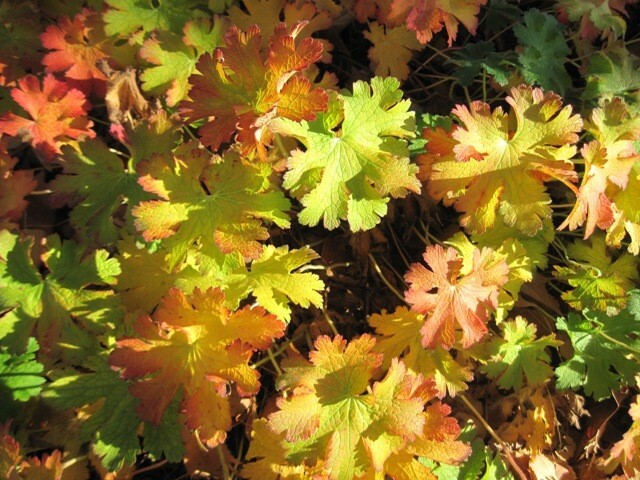 Cranesbills, as they are commonly known, offer a huge range of flower colors and the fading fall foliage takes on fiery hues of red and orange. Cutting the whole plant to the ground after flowering will result in fresh new foliage and often a second bloom. Tidy up any ragged winter foliage in early spring. Most are polite self-sowers, with the seedlings popping up in precisely the perfect spot. Make sure to tell all your friends you planted it there. Your secret is safe with me. 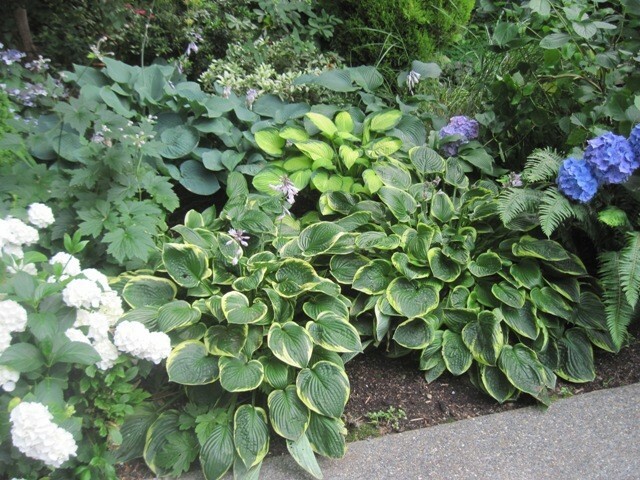 Magnificent in rich moist soils, hostas also do quite well in dry shade, and they have the courtesy of letting you know when they are thirsty by wilting a bit. A quick dose of water perks them right up. Another plant with a bewildering variety of options; try cultivars like ‘Francee’, ‘Halcyon’, or ‘Krossa Regal’. Or just pin a Hosta catalog to the wall, blindfold yourself, and toss a dart at the catalog. They are all worth a try. Hummingbirds and bumblebees love the trumpet-shaped flowers, and fall foliage often takes on nice tones of butter yellow. 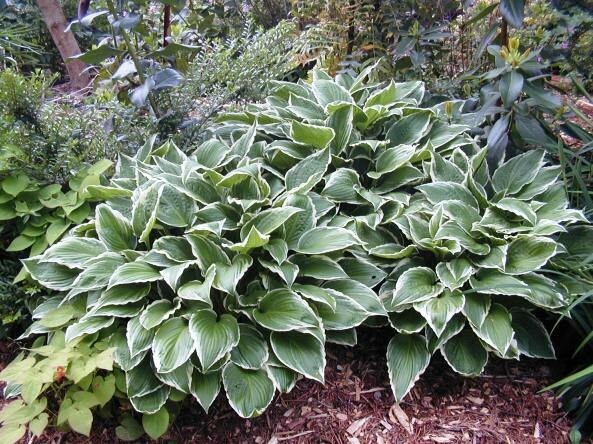 Slugs love hostas, so using one of the iron-based slug baits, like Sluggo, to protect the emerging foliage will prevent that unfashionably slimy, perforated look. Avoid using metaldehyde-based slug baits, which can be deadly to pets and wildlife. Two species of Bleeding Heart do well in dry shade, our native Dicentra formosa and selections of its Asian cousin, Dicentra spectabilis (Note that both of these have now been moved to the genus “Lamprocapnos”, which is further proof that taxonomists need to find some additional hobbies!) Both species go dormant in the summer, making them excellent companions for hostas, which will happily fill the space provided by the disappearing Dicentras. * Delicate fern-like foliage precedes the pendant heart-shaped flowers, which are produced prolifically in spring. Then the whole plant has the good sense to move to the cool climate of the basement wine cellar during the dog days of summer, returning with the spring rains. Many great selections of both species are available, with flower colors primarily in white, red, and pink. Novice gardeners often dismiss ferns because they lack flowers, but ferns are tough, durable plants that will tolerate a wide variety of horticultural misery, faithfully returning year after year and politely sowing themselves into spots only the most adventurous gardener would consider suitable for planting. As fern Goddess Judith Jones exclaims, “With fronds like these, who needs anemones?” The Pacific NW is fabulous fern country, and almost all our ferns do well in varying amounts shade, with several species tolerating a considerable amount of drought. Our natives Polystichum munitum (Sword Fern) and Dryopteris filix–mas (Male Fern) do great in woodland settings. Southern Europe offers Polystichum setiferum, the Soft Shield Fern. The arching fronds on this one are arranged like a pinwheel, resulting in a striking specimen when viewed from above. The type-species is a great plant; fern fanatics seek out named cultivars of P. setiferum at specialty nurseries and plant sales. Dryopteris affinis ‘Cristata the King’, a cultivar of an Eastern Europe/Western Asia species found in Cornwall during the height of the Victorian fern craze, is considered to be among the best of all possible ferns, with a rigid upright stance and boldly divided fronds. Don’t let its delicate appearance fool you, this is one tough customer. 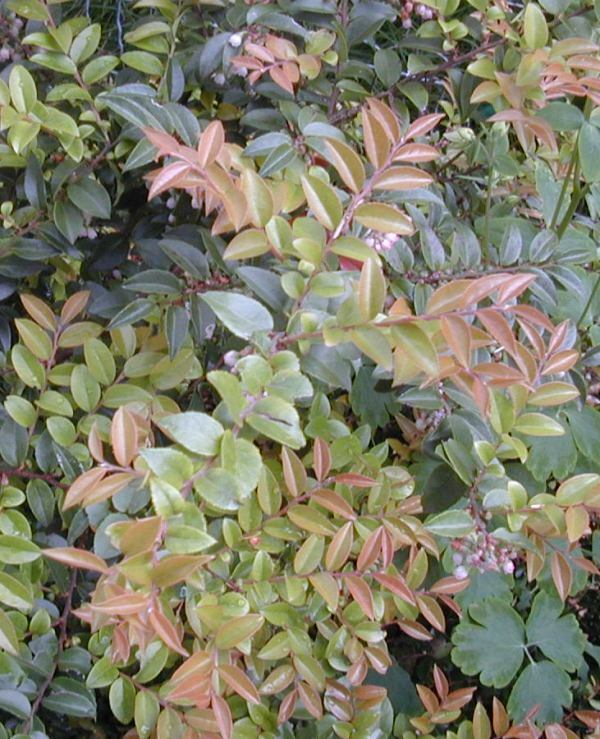 The Japanese Laurels are the undisputed champions of the “Shrub Most Likely to be Able to Grow in a Closet” category. 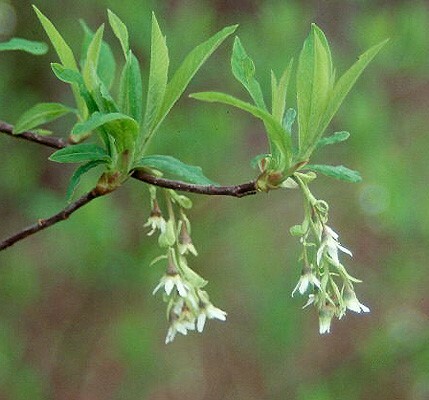 Trouble-free leathery evergreen foliage and small brownish-red flowers belie this plants membership in the Dogwood family. Female plants produce red berries if planted in close proximity to a male. The more common variegated varieties can be a bit of an acquired taste, but fans of Jackson Pollock will love the splashy sass of “Gold Dust’, ‘Picturata’, or any of the dozens of similarly psychedelic-yellow splashed cultivars. If your tastes run more to the serene than the sassy, you might prefer the lustrous green foliage of varieties like ‘Angustifolia’, or the dwarf variety ‘Rozannie’, which is self-pollinating. Reaches about 8 feet high and 6 feet wide in 10 years. This shrub doesn’t care where you plant it. It doesn’t care how you prune it. After a few years, it doesn’t care if you water it. For a plant with such a lousy attitude, it’s a miracle that this bad boy congenially pumps out tiny, sweetly scented flowers in October that will make you swoon with love and admiration as their delicious aroma drifts far and wide upon the autumn breeze. But ‘Gilt Edge’ doesn’t need your love and admiration either. Full sun to deep shade. Plant alone as a specimen, plant in groups for wildlife cover, or it makes a great hedge for a shady spot. Tastefully variegated in sharply contrasting gold and green, it really lights up a dark corner. Will eventually reach 10 feet in height and width, so give it some room. Or prune it. It doesn’t care… If you can't find 'Gilt Edge', Eleagnus pungens is basically the same shrub without the variegation but with the same fragrant flowers. 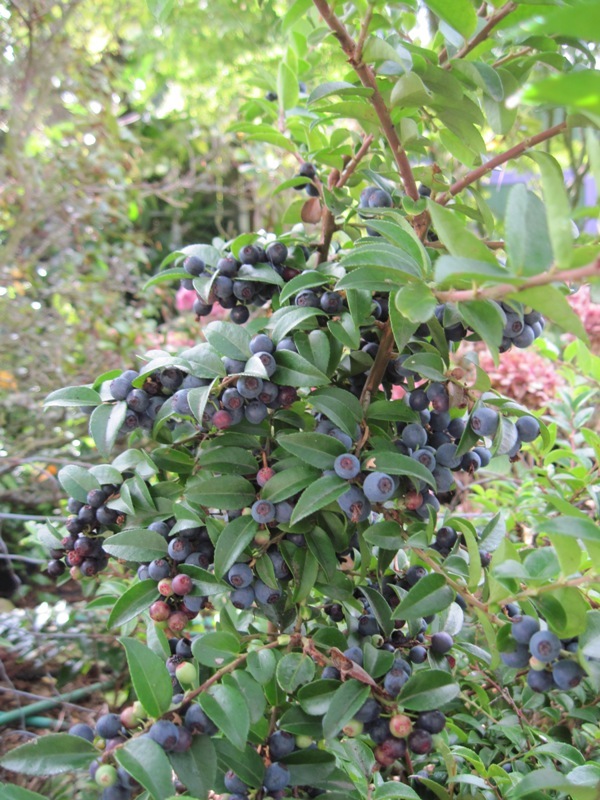 My enthusiasm for our native Evergreen Huckleberry was fully expressed in a previous blog post. Read all about it here. Another good hedge or barrier plant for shade. A monthly drenching over the course of the summer will increase berry crops. Perhaps the most appropriately named evergreen shrub of them all. Hefty, bold foliage that can carry its weight against any other plant in your “Northwest-tropical” garden. The NFL offensive lineman of shrubs. Weird looking drumstick-shaped flowers make it appear that someone looted the supply cabinet of your local marching band. Eventually reaches 10’ x 10’, but no pruning necessary. Just cut it back to 4 inches from the ground in spring if it outgrows its position. Then stand back before it swallows you whole. A foreground planting of ferns provides a great textural contrast to those XXXL-size leaves. Water a couple times during dry season for biggest foliage. This by no means an all inclusive list, but there’s certainly enough here to lift the spirits of even the most beleaguered would-be shade gardener. Just don’t forget to water a bit until your new plants establish a good root system. It’s a competitive, dog-eat-dog world under those trees. But Mama Nature abhors a vacuum, and there is a plant for almost any difficult situation. And if all else fails, shade makes a great spot for a bench, and benches are remarkably drought tolerant. 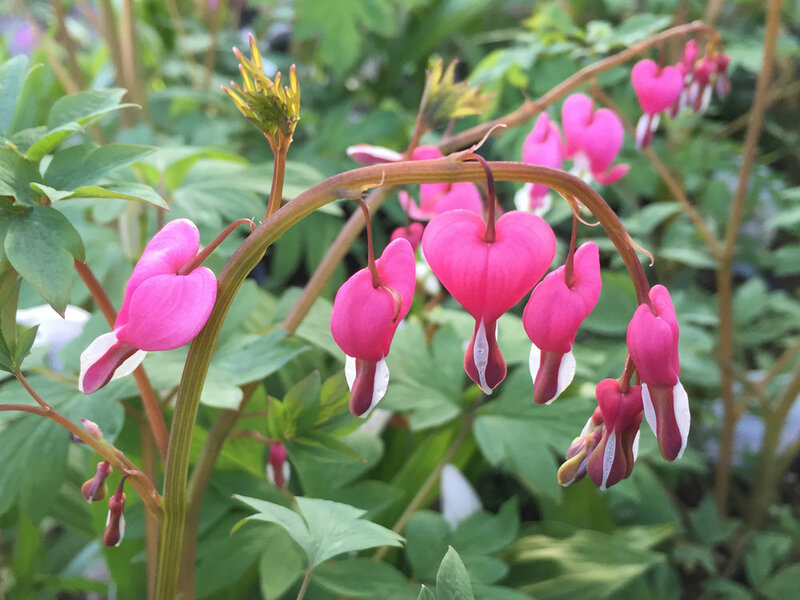 *Editor's Note: In dry shade, Dicentra will go dormant in the summer. If you would prefer to have summer foliage on your Dicentra, you will need to irrigate them throughout the summer.